Want to win your very own Pirate101 bundle? 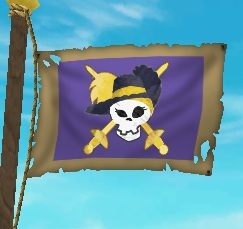 The first thing any Pirate needs is their flag to sail the skyways here is your chance to show off some creativity by creating your very own Pirate101 Flag. From Now October 9,2012 to October 19,2012. You only have 10 days!! * Create a Pirate101 flag by using any kind of physical art medium. Can be construction paper, felt cardboard, clay, material or even food. Any type of art constructive medium. It must be constructed not drawn. * You may paint/color your creation. * Email entry to Contest@PAIGEMOONSHADE.COM . Please remember you must have your piece of paper with name and date taken with picture. Winners will be posted in a new Pirate101 blog post by October 22,2012 6pm central. Make it a family project!! Have your family help you. See how much fun it can be for you and your family to create a Pirate flag together. Things that are fun and might help with icons. Can you use Paint on computer? No, Needs to be constructed.